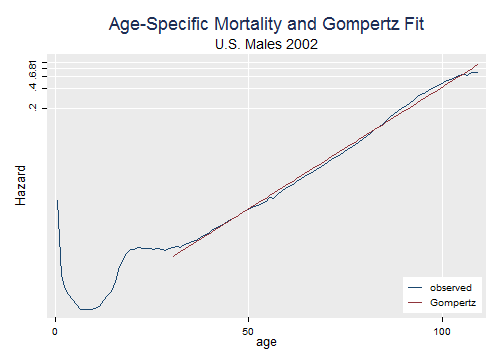 We will illustrate fitting a Gompertz model to U.S. adult mortality. The survival function for U.S. males in 2002 is available in the datasets section of the course website. We see the familiar shape and note that it is quite linear for adults, as shown by the red line based on a Gompertz fit. How do we get that? 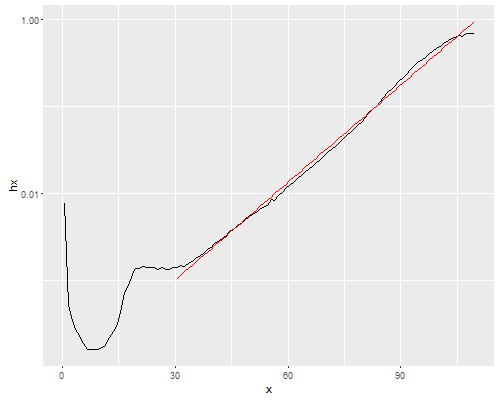 We get an R-squared of 0.9963 and estimates of -6.889 for the constant and 0.0858 for the slope. The course website has the survival function for U.S. females (the file is called us2002f.dat). Verify that age-specific mortality at age 30 is much lower for women than men (about half!) and that women seem to age a bit faster than men. But are adult female mortality rates ever higher than men's? Note: Updated february 2016 using latest data from the Human Mortality Database.